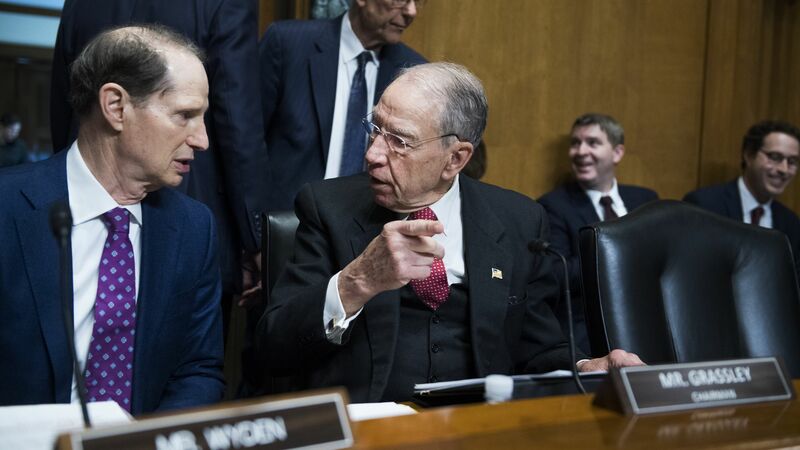 Situational awareness: Chuck Grassley has won a Grammy, and the federal government has charged 24 people for their alleged participation in a health care fraud scheme leading to $1.2 billion in losses. Choose your news. While it's too soon to declare a drug pricing fire, yesterday saw several smoke signals as the push to lower drug prices inched forward. The big picture: Lawmakers took real steps toward finding reforms that can gain bipartisan support, focusing on both drug manufacturers and members of the drug supply chain. The leaders of the Finance Committee have asked the HHS inspector general for an investigation into "spread pricing," Bloomberg reports, a practice by pharmacy benefit managers in which they charge health plans one amount for a drug and reimburse pharmacies at a different, lower rate. The House Ways and Means Committee unanimously passed a drug price transparency bill — something that previously has been pushed for mostly by Democrats. Maryland passed a bill late Monday night creating a board that would study drug prices and then make recommendations on how to lower them, WTOP reports. Yes, but: The Maryland bill originally allowed the board to set upper limits on what all plans would pay for certain drugs, but the state legislature watered it down — a win for the drug industry. And while transparency is widely regarded as an important step, that alone probably won't solve the drug price problem. The bottom line: None of these measures are going to make a huge dent in total drug spending, and none of them take pharma head-on. But any bipartisan action on bills that the drug industry doesn't like is another step into a new political world. Sen. Bernie Sanders will introduce a new version of "Medicare for All" today that's even more ambitious than his last one — which was already more ambitious than any other health care system on Earth, Axios' Sam Baker writes. Sanders’ plan would move almost everyone — whether you’re on Medicare or Medicaid, buy insurance on your own through the Affordable Care Act, or get it through your job — into a single government-run program. The other side: Taxes would go up. A lot. That’s the trade-off for eliminating premiums and deductibles. Sanders has not said which taxes he would raise. Overall spending would be about the same as what we’re expected to spend under the status quo, according to multiple estimates. We'd just pay for it differently. Today's hodgepodge of premiums, copays, and state and federal spending would all be rolled into one federal, taxpayer-funded program. Idaho Gov. Brad Little yesterday signed into law a bill adding work requirements and other addendums to the Medicaid expansion program approved by 61% of voters in November, the Idaho Statesman reports. Idaho is now the second red state to make changes to what voters approved last year, following Utah's rollback of its Medicaid expansion. The bill follows the second defeat of work requirements in court, bringing into question whether the work requirements will survive. Go deeper: The bill may break the law in other ways too, according to the Statesman. Doctors' salaries have increased 20% since 2015, according to a new Medscape report, outpacing pay among the general public. Why it matters: In the health care system, one person's salary is another person's premium, co-pay, deductible, taxes ... you get the picture. The gap between what male and female doctors are paid increased from 18% in 2018 to 25% in 2019. Four of the five states where doctors make the most are in the South. Nearly three-fourths of physicians said they spend more than 10 hours per week on paperwork. In 2012, about half of respondents said that they had 1–4 hours of paperwork per week. Tufts, for example, allowed a high-ranking Purdue executive who said in 2003 that OxyContin wasn't addictive to lecture in the pain program and receive the title of adjunct associate professor. The Massachusetts attorney general has alleged that “Purdue got to control research on the treatment of pain coming out of a prominent and respected institution of learning." Johnson & Johnson, Pfizer, Merck and Abbott Laboratories collectively kept $7 billion in tax savings last year due to lower corporate tax rates and bringing home cash that was parked overseas, according to a new report from anti-poverty charity Oxfam. Why it matters: The Republican tax law made it possible for the largest pharmaceutical companies to retain money that otherwise would have gone to public coffers, Axios' Bob Herman reports. But as Oxfam notes, there has not been a corresponding increase in drug development or lower drug prices. The big picture: “These pharma giants are certainly not the only examples of multinational companies benefiting from the new US corporate tax regime,” Oxfam wrote in its report. Thanks for reading, and keep sending in your thoughts and feedback!